If you read my beginners guide, you’ll know that being smart about online purchases can gain you lots of points and miles. 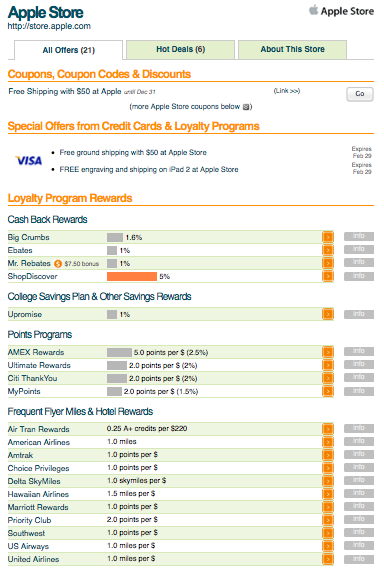 On Monday I highlighted many upcoming mileage mall bonuses, like 10 Chase Ultimate Rewards points per dollar spent at Apple on November 28th. However, with so many mileage malls and cashback sites, it can become confusing figuring out which one will give you the best deal. Luckily, there’s a website that can help you evaluate all of your options: EVreward.com. I have to be honest, I just recently became aware of the site and I haven’t extensively used it, but it’s the only site I know that is comprehensively aggregating online mileage shopping earning opportunities and presenting them in a clean format. However, it’s not 100% perfect – it often misses some limited time promotions, so it still might behoove you to do your research before making any big purchases online. I recently checked it out to see what the best deal for an Apple purchase would be and it showed that American Express would give me 5 points per dollar (and Chase only 2). However, I know that Chase is actually offering 10 points per dollar on November 28. Chase Ultimate Rewards was just added to this site, so I’ll cut them a little slack, though I still think it should list limited time promotions, since many of the best deals are often only good for a short time. So while it’s not the end-all solution to online shopping, it’s a great resource that I hope will continue to get more and more comprehensive as it grows.